You know how sometimes you can find a comic book which is pretty much flawless, and keeps you reading page to page till before you know it you have read the whole book in an afternoon, Kabuki for me this was one of those. It’s a graphic novel with freaking awesome artwork which I could probably best describe as a modern take on manga which suits the books theme well being set in a technology and traditionally driven Japan. If you liked Frank Miller’s Ronin you can’t go far wrong with this. 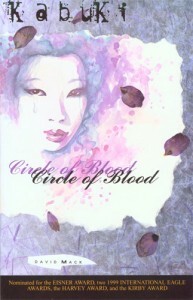 The art work drags you in deep with an award winning story the combination cant go far wrong. I would love to run through the backbone of the story but I don’t want to spoil anything, but basically the setting is a post war Japan which is run by corrupt corporate business kingpins which are swiftly creating a huge footprint of crime. Enter the Noh, eight samurai assassin chicks each with dragon tattoos and a hundred ways to kill you – if you’re on the wrong side that is. The story follows one of the Noh assassin code named Kabuki who has a troubled child hood and struggles with her past, well till she kills a load of people who she thinks are to blame for it. Book Depo has a nice selection of Kabuki Graphic novels in at the moment.